It’s the first time that three women share the Nobel Peace Prize and their stories are of amazing leadership that brought an end to decades-long dictatorships. So why are they nowhere to be found on Barbara Walter’s list of the 10 Most Fascinating People of 2011? Arguably, their contribution is more remarkable than say… the Kardashians? Are their stories not more interesting than Pippa Middleton’s love life or Donald Trump’s hair? I admit, I first heard about Leymah Gbowee on The Daily Show with Jon Stewart but it led me to question why media empires serve us a steady diet of drivel and why we eat it up. 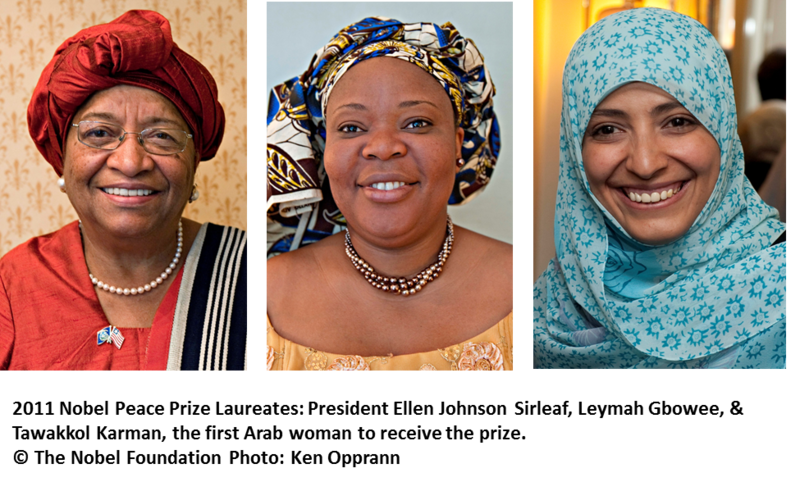 That’s why I invite you to balance and enrich your leisure time diet by finding out more about 2011 Nobel Peace Prize laureates: President Ellen Johnson Sirleaf and Leymah Gbowee, both of Liberia, and Yemeni activist, Tawakkol Karman, the first Arab woman to receive the prize. Yes, there are only 24 hours in the day, and it’s ok to indulge in some American sports and entertainment brain candy. But today, right now, embrace the opportunity to provide some balance in your ‘entertainment’ diet and discover more about our world and its inspiring leaders. These women are the Martin Luther King Jr. and Nelson Mandelas of our time! I promise, you will be moved beyond anything that Hollywood can conjure up. I have never asked that you share one of my posts with others but please share this one. Certainly not for me but in honour of these women who, by all rights, should be household names not only in their own countries but throughout the world.